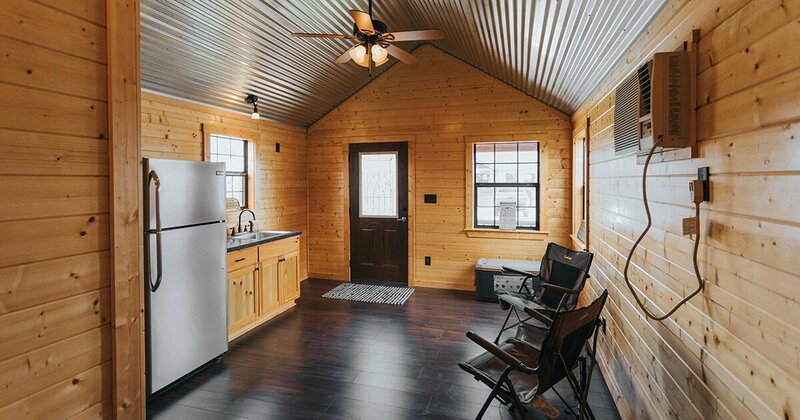 The options for finishing the interior of your Texas prefab log cabin are vast. You can take the interior design of your cabin in just about any possible direction you can imagine. At Leland’s, we offer custom cabins. That means you can have your cabin your way. We offer both laminate and plank flooring, both brands that have a tried and true history of standing up well to typical wear and tear. In addition to durability, all three of the flooring options we offer are beautiful. So how do you choose? How do you decide between a durable, beautiful laminate floor, and a durable, beautiful wood plank floor? Laminate flooring is a synthetic material produced by fusing several layers of flooring material together. It’s also sometimes called wood tile or floating wood tile. It comes in interlocking sheets that are laid on a moisture barrier or underlayment material. The laminate tiles aren’t nailed or glued, which is why it’s referred to by some as a floating floor. The multi-layer construction means the laminate tiles are sturdy yet still moderately flexible. The flexibility makes installation easier as each row interlocks with the previous row. With laminate flooring, it is very important to keep the flooring dry. Standing water is bad for any wood floor, but water left on laminate can make the seams between the interlocking pieces swell, causing it to have a raised appearance that doesn’t go away even after the moisture is gone. So any spills need to be cleaned up right away. Our cabins are watertight, so there’s no concern about moisture creeping up from underneath the flooring. Additionally, it’s important to keep the top, protective layer intact. While the protective surface is more resistant to scratches than natural wood products, it’s still recommended you add felt pads to your furniture. Once that protective layer has been destroyed, there’s no getting it back. The biggest check mark in laminate flooring’s favor is the price. Laminate flooring products start at a lower price point than wood plank. It means you’ll pay less overall for your cabin. The other good point to laminate flooring is its longevity. The average lifespan of most laminate floors can range from 15 to 25 years. And many laminate floors last longer than that, but their appearance begins to show their age. Laminate flooring is also super simple to keep clean and beautiful. A dust mop or broom with occasional spot cleaning will serve you well. When the floor has really seen some muddy feet, simply using a damp dust mop or rag will be all you need to get it back to perfection. And if you decide you’d like to completely change the look of your cabin, you can do so by replacing the laminate flooring. Installation is simple, as is removal. No carpet tack strips to tear up, and no glue to contend with. Underneath your laminate floor will be a floating layer of protective underlayment on top of solid subfloor. It will be a blank slate. What is Wood Plank Flooring? Wood plank flooring is a term that is often used interchangeably for a couple of types of flooring. The first is an all-natural, wide-plank hardwood floor. It’s like your traditional hardwood flooring, except the pieces of wood are wide instead of strip-like, as you’re used to seeing with traditional hardwood. The second meaning for wood plank flooring is an engineered wood plank that is more similar to laminate flooring in its construction. It consists of multiple layers of material with a natural wood appearance. This is what we offer at Leland’s. The price point on wood plank flooring is a bit higher than laminate. And it’s also important to keep this floor dry, as it is with any wood product. You won’t be able to refinish this flooring time and time again as you could with a hardwood floor, but it’s protective layer is more resistant to scratches and dents than hardwood. Or wait, that isn’t really a downside to this type of flooring, is it? While the price point is higher, the reason for that is a combination of the look of wood planks and its durability. You can lightly sand and refinish the surface of the wood plank flooring we offer, which means its longevity surpasses that of laminate. With a light sanding and refinish to even out the wear pattern, your wood plank flooring can last you for 30 or more years. And as for the look, we offer a hand-scraped wood plank, which offers a classic look to your cabin. Cleaning and care are simple as well. A simple wiping up of spills and spot mopping is all that’s needed. Frequent use of a dust mop will keep the floor shiny and beautiful. Installation is also simple with interlocking planks. And no glue or fasteners of any kind are needed on this flooring either. When I close my eyes, which floor looks best under my feet as I relax in my custom built cabin? Come visit us at the largest cabin showroom in Texas at our Grandview headquarters, and we’ll be happy to help you make your vision a reality.